I don't know what happened but my client won't download the data. The client gives me this error instead and it wasn't like this before the patch came. I have tried everything I could. I read the technical help posts by @Orange, tried re-installing it, disabled my windows firewall, but to no avail. There's no antivirus software installed on my laptop, so that can't be the cause. Try restarting your router, it seems like a connection issue. The installer will be updated soon, then you won't have to patch on reinstall. The problem wasn't on my connection either. I've tried restarting my router, but the problem still persists. I also tried connecting to my portable hotspot but nothing solved the issue. I'll be waiting for the updated installer. did you use VPN or any other proxy? I don't use any of them. 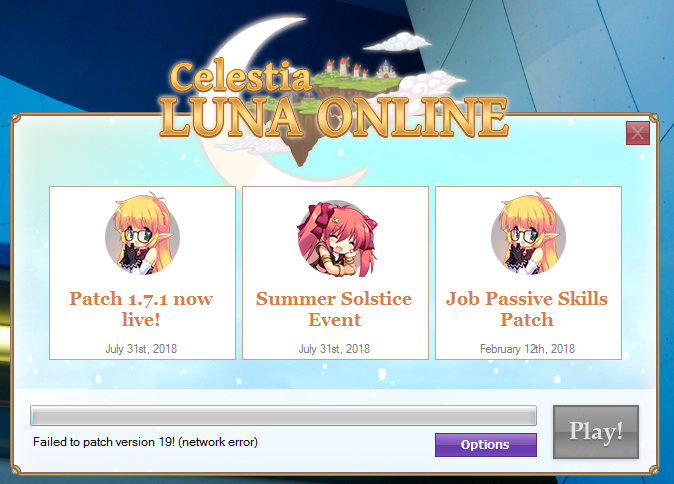 Everything was fine before Patch 1.7.1., I got no patching problems on last February. I'll just wait for the updated installer. Does it happen right away when you launch the patcher or after downloading a specific file? It happens as soon as I launch the client patcher. UPDATE: This is the moment I've been waiting for! I copied the entire game folder (patched) from another working computer and it's working now. Thank you. You can close this thread if you want.